All parents dread the possibility of a knock on the door late at night to inform them that their teenager has been the victim of a car accident. Most parents never have to experience that trauma, but for those who do, the shock and heartache is something from which one does not easily, if ever, recover. MADD Canada reports that road crashes are the leading cause of death for teenagers. When young drivers are behind the wheel and an accident occurs, inexperience and immaturity are cited as the main reasons for the crash. Transport Canada reports agree that young drivers and passenger fatalities are disproportionately represented in motor vehicle accident statistics. The situation is similarly troubling for cyclists. Children (5-14), adolescents, and young adults (15-29) have the highest rate for cycling related injuries, with the latter two groups having the highest incidence of deaths due to cycling collisions, according to the Centre for Disease Control and Prevention (CDC). How do we keep our children safe? Certainly, stricter Ontario driving laws and fines for young drivers, distracted driving and driving under the influence are aimed at reducing potential motor vehicle accidents and the resulting injuries and deaths. With regard to cycling, there is some disagreement in Ontario municipalities, concerning who is more commonly at fault in vehicle/bicycle collisions, the driver or the bicyclist. However, many studies agree that aggressive driving and speeding, and failing to watch for cyclists when making a turn, commonly play a role when the driver is at fault in a bicycle collision. When the cyclist is deemed to be at fault in a collision, inadequate bike lighting equipment and failure to obey the rules of the road are frequently cited as reasons for an accident. A 2013 Canadian study found that over 90% of bicycles involved in night time fatalities have inadequate lighting. Some people also criticize the lack of infrastructure in Ontario, such as bike lanes, as another factor in bicycle accidents. A reduction in the number of deaths and injuries to our young people must be a two-pronged approach; fines and penalties for aggressive or negligent drivers must be sufficiently steep to be a deterrent, and children need to be better educated about safe cycling practices from a young age. Three friends, 17 and 16 years old, were biking on a quiet portion of Innisfil Beach Road on a drizzly early morning at around 1:30 a.m. on October 28, 2012. The three friends were returning home from Tim Hortons when they were struck by an SUV. One of the boys, Brandon Majewski died after suffering multiple catastrophic injuries; another friend, Richard McLean suffered a broken pelvis and other broken bones; and the third friend, Jake Roberts sustained minor injuries after being thrown from his bike. The boys were riding abreast at the time of the accident and were not wearing helmets. The South Simcoe Policy report named the lack of visibility of the cyclists as a major contributing factor for the accident. Anyone who is a parent has some sense of the terrible trauma that the Majewski family, residents of Alcona Ontario, will have been struggling with, even many months after their son’s death. More difficult to imagine is the next blow to the family: 18 months after the accident, the driver of the SUV, Sharlene Simon, is suing the deceased boy, his parents and the two other boys for the emotional trauma she claims to have suffered from the incident. Also named in the lawsuit is the County of Simcoe, for failing to properly maintain the road. The action of someone bringing suit against a child that they killed is extremely uncommon. Nevertheless, Simon is bringing a claim for $1.35 million in damages she alleges for psychological suffering. Simon maintains that she is suffering from anxiety, depression and post-traumatic stress, and states “...her enjoyment of life has been and will be lessened". Simon’s lawsuit blames the boys’ negligence in bicycling and applying their brakes properly for the accident. Brandon’s father stated that the bikes had reflectors which should have been visible to the driver. In the South Simcoe Police report, Simon admitted to driving 10 km/hr over the speed limit of 80 km/hr and claimed that she did not see the pedal reflectors or the boys on their bikes. The impact of the bikes on the SUV resulted in various damage including a cracked windshield, dented bumper and damaged headlight. In an earlier suit, the lawyer for the Majewski family and the boys who were injured began an action against Simon for medical expenses, funeral costs and lost income incurred by the boys' families, and also against Simcoe County, for a total of $900,000. Their suit charges Simon for failing to take reasonable care to avoid a collision which she should have foreseen, and also alleges that Simon was speeding, and possibly impaired and talking on her cellphone. Although Simon was on her way home from a Halloween party, no breathalyzer was performed at the scene of the accident; however, a roadside screening test was administered and showed zero alcohol in Simon’s blood. No charges were laid against Simon. She was being followed by her husband, Const. Jules Simon, a York Regional Police Officer, who was driving in a separate vehicle at the time of the collision. These suits have not yet been resolved, so the outcome remains to be determined. Both parties will rely on their respective lawyers to present a strong case for damages and to successfully prove fault on behalf of the opposing party. At this stage, public opinion in social media has weighed strongly in support of the parents and friends who suffered injuries and the loss of a son and a friend. Whether or not the trial finds negligence on the part of either Simon or the boys and their families, the fact that a child has died is catastrophic and indisputable. 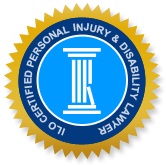 If you have experienced serious injuries or the loss of a loved one due to an accident, the Personal Injury Lawyers of Ontario (ILO) law office serving the Midland area has the expertise to reach a favourable settlement for you in your claim for damages, accident benefits or disability coverage. We have an experienced team in claims for injuries arising out of motor vehicle accidents, slips and falls and many other accidents resulting in injury. Call us today for a free consultation.